MDR & MB visited the concrete jungle (Auckland) yesterday for some retail therapy, a visit to the Maritime Museum and the movies. 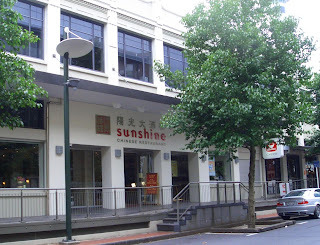 The pair had one of the best Yum Cha meals they had ever experienced at Sunshine Restaurant in Market Place, just near the waterfront in Auckland CBD. Sunshine was recommended by Lonely Planet and didn't disappoint. The portions were large, the buns were full of meat and the service was super fast and reasonably priced, 10 out of 10.